Pre-planning provides peace of mind for everyone involved. A carefully preplanned service can be the most comforting to your family; it spares them from having to face decisions that can be both emotionally and financially difficult at the time of death. It will give them lasting peace of mind to know that they have acted in accordance with your wishes. Making pre-arrangements can be as simple or as detailed as you wish. You can make the selection of the services, casket, music, etc. or simply record the information that will be needed for legal forms and other paperwork. Another reason to pre-plan is to ensure that your family will receive all of the benefits for which they are entitled. 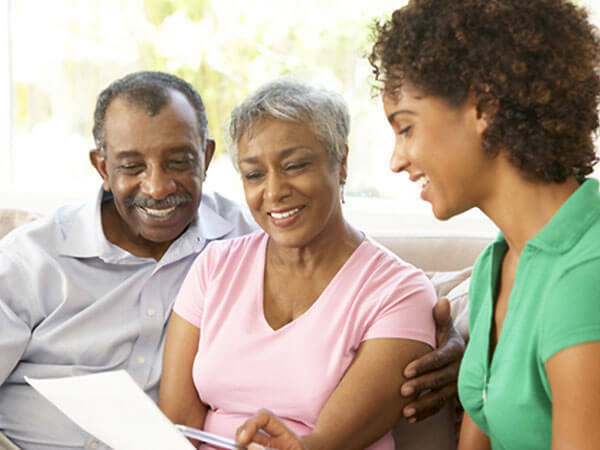 It is important that all of your personal records, including bank account numbers, investment information, insurance policy numbers and location of important papers be accessible to your family in the event of a death. All of these and your personal wishes for your funeral can be recorded in a Personal Arrangement Guide booklet that we provide free of charge. This ensures that the protection you worked and planned for, will be received by your beneficiaries when they need it most. Although not required when making pre-arrangements, most people choose to set aside funds that will cover their future funeral and final expenses. With our “Complete Care Prearrangement Program”, we offer a variety of prepayment programs which allow you to control cost, avoid emotional overspending, and guarantee today’s price. At Covenant, we offer the area’s widest variety of payment plans and will tailor a plan that allows you to plan for tomorrow within your budget. One of our directors can meet with you at your home or at our funeral home to explain the various programs and answer any questions. All funeral home service charges and merchandise items are price guaranteed as per the terms of our “Complete Care” preneed contract. You decide today what type of arrangements you want and how much you want to spend… at a time when decisions will be made calmly and intelligently. This avoids emotional overspending. The code of Virginia requires that your funds be placed with a state approved third party. This protects your funds for the future. In addition by being irrevocable your funds are protected from Medicaid regulations. You can make preneed funeral arrangements in our funeral home or in the comfort and privacy of your own home. Furthermore we offer the area’s widest selection of plans to make sure your planning for tomorrow fits into your budget today. By having the area’s widest range of plans we can offer Covenant Complete Care preplanning to everyone regardless of their age or health. In the event you move from our neighborhood, your pre-need funeral contract is transferable. We work with you to find a firm in your new home that will accept the plan. 7. Work with our directors not sales people. Many firms, especially those that are owned by large corporations, employ commissioned sales people to work with preneed families. At Covenant, however, you work with our funeral directors, who receive no type of special consideration based on what you spend. This creates a relaxed, stress-free environment in which you get what you really want. The Option to Prepay – When you prepay, you can lock in today’s prices. Our funeral director will explain each payment method and investment option available, and will help you make a decision that best suits you and your family. Your Family Keeps More – When you prepay, your estate will owe nothing on funeral expenses. More of your assets and life insurance proceeds will go directly to your family.